Do rechargeable batteries have a lower capacity than disposable alkaline batteries? This is really a huge challenge for all of us because you can see companies everywhere advertising their “battery fact” as rated capacity and what they are really doing is perpetuating the “battery myth” that disposable batteries have a greater actual or available capacity than rechargeable batteries. The actual or available capacity for a battery is way more important to actual usage but is also more complex to determine, because it really depends on what you are using the batteries for. For most high drain electronic devices, like digital cameras, rechargeable batteries will continue to work much longer than alkaline batteries. In fact, in devices like digital cameras, NiMH batteries will run on a single charge for 3-4 times as long as they would on an alkaline battery. Heavy Duty, Super Heavy Duty, High Capacity, Quick Charger, Rapid Charger, Ultra, Long Life, etc. Since there are no real industry standards, many terms used by battery manufacturers have become misleading marketing hype. 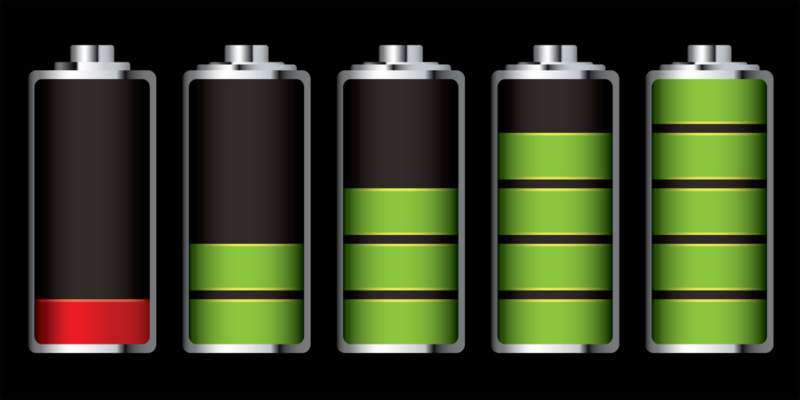 “Heavy Duty” batteries are often the least powerful batteries you can buy and some “quick chargers” can take as long as seven hours to recharge a set of batteries! For example the term Heavy Duty battery was used to refer to Zinc chloride batteries which had about 50% more capacity than traditional carbon zinc batteries. But that was 50 years ago! Calling zinc chloride batteries heavy duty became misleading once alkaline batteries with 300% more capacity than zinc chloride batteries became available. A similar situation happened with battery chargers. Originally NiCd battery chargers took anywhere from 12-24 hours to recharge NiCd cells. Later, chargers that could recharge NiCd cells in half that time were introduced. Unfortunately, calling these chargers “quick chargers” was a real disservice to the rechargeable battery industry. Anyone that purchased NiCd cells and a “Quick charger” only to realize later that a quick charge took seven hours must have been very disappointed. The good news is that it’s now possible to buy a battery charger that can recharge batteries in less than two hours, and in some cases even as fast as one hour or less!! Battery capacity ratings are meaningless when used to compare different types of batteries or to compare the capacity of batteries powering different types of devices. This means that you may not be able to predict how long your electronic device will run just by looking at the capacity rating of a battery. For example AA alkaline batteries typically have a capacity rating of over 2,500 mAh and AA NiMH batteries have rated capacities of only 1,200 to 1,900 mAh. But when it comes to actually powering an electronic device like a digital camera, the NiMH batteries will often run the device for three or four times as long. Unfortunately, even comparing the capacity ratings of similar types of batteries won’t always work because different manufacturers often measure battery capacity in slightly different ways. Alkaline batteries stored at “room temperature” self discharge at a rate of less than two percent per year. So normally refrigerating or freezing them will only help maintain their charge by a tiny amount. Hardly worth the effort of chilling them. However, if alkaline batteries are stored at higher temperatures they will start to lose capacity much quicker. At 85 degrees F they only lose about 5% per year, but at 100 degrees they lose 25% per year. So if you live in a very hot climate or are storing your batteries in a very hot location, it may be worthwhile for you to store your alkaline batteries in a refrigerator instead. NiMH and NiCd batteries self discharge at a MUCH faster rate than alkaline batteries. In fact, at “room temperature” (about 70 degrees F) NiMH and NiCD batteries will self discharge a few percent PER DAY. Storing them at lower temperatures will slow their self discharge rate dramatically. NiMH batteries stored at freezing will retain over 90% of their charge for full month. So it might make sense to store them in a freezer. If you do, it’s best to bring them back to room temperature before using them. Even if you don’t freeze your NiMH batteries after charging them, you should store them in a cool place to minimize their self discharge. It’s best to recharge batteries slowly. Quick charging NiMH batteries will reduce their life. For practical purposes with batteries that are designed to be quick charged, for example, Sanyo, GP, POWERhaus, that is not true. It is important to use a battery charger that has been specifically designed to rapid charge NiMH cells. Actually there is a much greater likely hood of reducing the life of a NiMH battery by using an “overnight” charger than by using a smart fast charger. Overnight chargers rely on the fact that you will unplug them after a number of hours. If you forget to unplug them they can continue to charge the batteries longer than they should. Overcharging WILL reduce the life of batteries. From a strictly technical sense, a battery that is always slow charged will likely last a little longer than one that is always rapid charged. However, the difference is so small that it is not likely to be noticeable for most users. Assigning capacities to batteries can be very tricky, that’s probably why you don’t see capacity ratings marked on most alkaline batteries. When powering high drain electronic devices like digital cameras, computer peripherals, or portable music players, an alkaline battery will only deliver a small fraction of its rated capacity. A NiMH or NiCd battery is likely to deliver much closer to its rated capacity when it’s powering high drain devices. This means that a NiMH battery with a rated capacity of 1800 mAh can take many more photos than an alkaline battery with a rated capacity of 2,800 mAh.